The perfect soil for planting or adding to flower and vegetable beds. Ensuring beautiful blossoms and a generous harvest of vegetables . 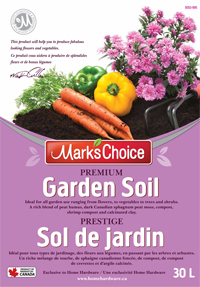 Mark’s Choice Premium Garden Soil is a rich blend of peat humus, dark Canadian sphagnum peat moss, compost, shrimp compost and calcinated clay. The premium quality product is the perfect mix for outdoor gardening because it has high organic matter content and high water holding capacity. It puts new life in soil while helping to promote healthy growth.